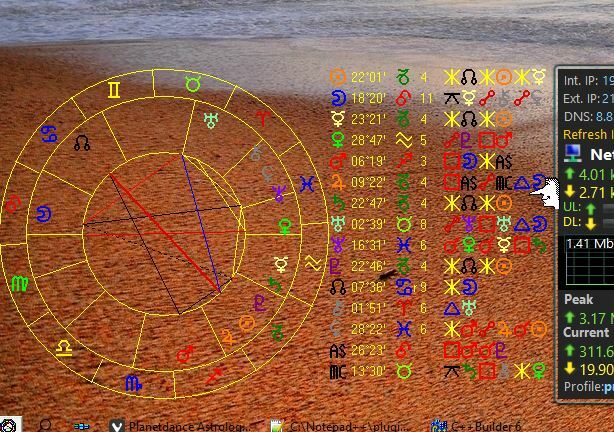 AstroClock is a little windows program to display planetpositions transparently on your desktop. It only works if Planetdance is installed. Hold Control, click on a visible spot (tip: use the handle on the bottom) and drag the program with the mouse to a suitable spot on your desktop. Right click on a visible spot for a menu. You can close the program and access the options window. Font - Sets the font, size and color for texts. Autostart - Check to always start AstroClock when windows starts. Frequency - Number of seconds between calculations, minimum is 10 secs. Planets - Here you define which transit planets are calculated. Grip - Size of the grip at the bottomline. Set to 0 to disable. Exclude - Use this to add programs to the list with exclusions. When a program is in the exclude list AstroClock will not update if it detects that program running. So if you have CPU intensive programs that you don't want to run together with AstroClock, use this feature. A doubleclick on a program in the list will delete it. Color, choose from a planetdance colorset. Wheel - Enables the wheel, set it's size with Radius. Which aspects the wheel displays is taken from Planetdance's default single aspects settings and orbs are taken from planetdance's default orbs file. Use Orb to increase / decrease the orbs. Use the button at the end to choose another file for the aspect settings. Declination, shows a declinations column. Big sets the size of the symbols. Symbols lets you choose the symbols. Space sets the horizontal space between lines. Radix - Enter a planetdance database filename and a name in that database. The program will show in which house a transit planet falls and which aspects it makes. After succesfully choosen a database and a person, the checkbox Enabled will be checked. Uncheck this box to disable the feature. 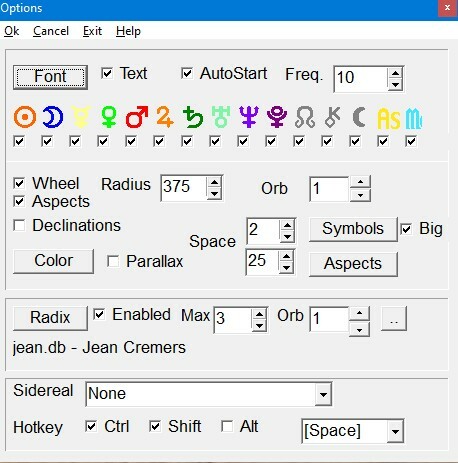 Which aspects are displayed is taken from Planetdance's default bi wheel aspects setting, orbs are taken from default bi wheel orbs file. Use the button at the end to choose another file for the aspect settings. Max - Max aspects between the radix and the transit that are shown after each planet. Orb - Increase / decrease the orbs for aspects between the transit and the radix. Exit will terminate astroclock completely. While the options windows has focus the timer for calculations does not run. Default place is used for timezone and coordinates. Dst / summertime is taken from windows as it's more reliable than planetdance methods. Default language is used for text. If you have trouble with the time you can adjust it by adding a line to astroclock.ini like zone=60, which will adjust the timezone 60 minutes forward.